The beautiful Cooper-Siegel Community Library opened on April 30, 2011. Our Federalist style library boasts the latest technology, a carefully curated collection, large well-lit reading areas, the cozy Scott Family Reading Room with fireplace, and private rooms perfect for individual or group study and tutoring. The Fritz Mitnick Welcome Garden provides a lovely outdoor environment to read, visit or meditate upon the variety of trees, plants and shrubbery. The McIlroy Teen Room is home to teens reading, using computers or participating in Teen programming. And most popular of all, the Lauri Ann West Children’s Room has an expansive collection of picture books, CDs, puppet kits, young readers and chapter books. The Hulmes Family Story Room finds children enraptured by books read aloud while the Rockwell Family Art Studio provides a space to create art projects that help children process and retain the stories they have heard. The library serves the Fox Chapel Area School District municipalities of Aspinwall, Blawnox, Fox Chapel, Indiana, O’Hara and Sharpsburg as well as any Allegheny County or City of Pittsburgh resident. You may borrow books or utilize our services with a library card from anywhere in the region. Eric Cooper and Naomi Siegel made a naming gift to the Library to honor their family’s love of books and learning as well as their commitment to community resources that enrich the lives of all residents in our service area. Naomi eloquently explains the importance of libraries in her essay that begins with the intriguing quote “Libraries will get you through times of no money better than money will get you through times of no libraries.” She also goes on to humorously explain that, “Every time I decide to defer buying a book in favor of checking it out of the library to see if I really want it, I vow to make a contribution to the library in an amount equivalent to the amount I’ve saved. After almost 25 years of promising this, we’re finally doing it. 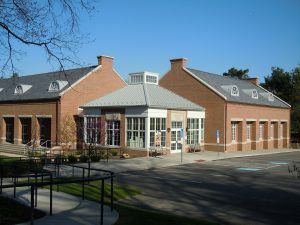 I think we’ll still owe the library.” From 1986 – 2011 the predecessor of our library operated on Powers Run Road in the former Boyd Elementary School as Lauri Ann West Memorial Library. A student at Boyd Elementary School, Lauri Ann died unexpectedly as a child. Her family honored her love of books by making a naming gift to build a library as an addition onto the Elementary School. When the school closed, the Lauri Ann West Memorial Library re-opened as a public community library. Continuing her legacy, the children’s room at the Cooper-Siegel Community Library is named the Lauri Ann West Children’s Room.